Last month Grant Hardie (05-10) and his team, representing Scotland, won gold at the World Mixed Curling Championships held in Champery, Switzerland. This season, after a few years’ playing in different teams Grant and Hamilton McMillan (04-10) have got together with Bruce Mouat, from Edinburgh, (Team Mouat) and Bobby Lammie, from Stranraer. 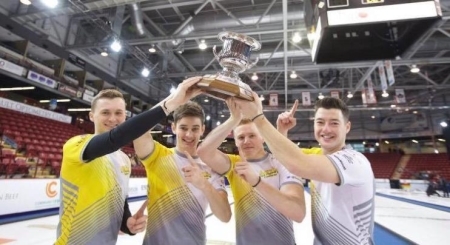 They recently spent a few weeks curling in Canada and won the first two competitions then went on to win a 'Grand Slam' competition in Sault St Marie, Ontario, beating the current Olympic Champions, World Champion and other top teams on their way to the victory. This is only the second time a non-Canadian team, and the first time a Scottish team, has won a Grand Slam event…and Bruce is the youngest skip ever to have won. They are now looking forward to playing in the Scottish Championship in February and all this after their first win together at The Scottish Schools Championship representing Merchiston in 2010.